In one of earlier post we introduced to decision making statements in c.Today we shall learn about one of the decision making statement in C “switch statement“.The switch statement allows you for checking a equality among the options available and then perform actions according to it.For checking the equality we use the keyword case.After executing the statements related to the choice we need to break it or else it will executed continuously without any break. 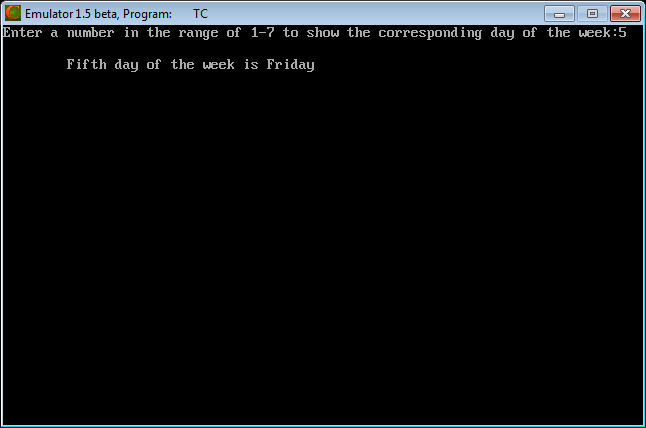 Each switch may or may not contain a default statement.If the given value doesn’t matches to any of the case value then the default statement’s execution will be done.A simple program to display the execution of switch statement and to display the name of the day with input as number. This entry was posted in C and tagged c program using switch statement, program using switch case in c, switch case example in c, switch case in c example, switch case in c language, switch case in c programming examples, switch case in c syntax, switch case statement in c, what are condition of switch case in c programming, write a switch program in c. Bookmark the permalink.